It’s hard to understand why African Americans are incarcerated at higher rates than other groups without knowing what the black codes were. These restrictive and discriminatory laws criminalized blacks after slavery and set the stage for Jim Crow. They are also directly linked to today’s prison industrial complex. Given this, a better grasp of the Black Codes and their relationship to the 13th Amendment provides a historical context for racial profiling, police brutality, and uneven criminal sentencing. For far too long, blacks have been dogged by the stereotype that they’re inherently prone to criminality. The institution of slavery and the Black Codes that followed reveal how the state essentially penalized African Americans just for existing. The enactment of the 13th Amendment only amplified the challenges of African Americans during Reconstruction. Passed in 1865, this amendment ended the slave economy, but it also included a provision that would make it in the South’s best interest to arrest and imprison blacks. That’s because the amendment prohibited slavery and servitude, “except as a punishment for crime.” This provision gave way to the Black Codes, which replaced the Slave Codes, and were passed throughout the South the same year as the 13th Amendment. How exactly does a police officer decide how well a person handles money or if he’s wanton in conduct? Clearly, many of the behaviors punishable under the Black Codes were completely subjective. But their subjective nature made it easier to arrest and round up African Americans. In fact, a variety of states concluded that there were certain crimes for which only blacks could be “duly convicted,” according to "The Angela Y. Davis Reader." Therefore, the argument that the criminal justice system works differently for whites and blacks can be traced back to the 1860s. And before the Black Codes criminalized African Americans, the legal system deemed runaway slaves fugitives for stealing property — themselves! Violating one of the Black Codes required offenders to pay fines. Since many African Americans were paid low wages during Reconstruction or denied employment at all, coming up with the money for these fees all too often proved impossible. Inability to pay meant that the county court could hire out African Americans to employers until they worked off their balances. Blacks who found themselves in this unfortunate predicament usually did such labor in a slavery-like environment. The state determined when offenders worked, for how long and what kind of work was performed. More often than not, African Americans were required to perform agricultural labor, just as they had during slavery. Because licenses were required for offenders to perform skilled labor, few did. With these restrictions, blacks had little chance to learn a trade and move up the economic ladder once their fines were settled. And they could not simply refuse to work off their debts, as that would lead to a vagrancy charge, resulting in more fees and forced labor. Under the Black Codes, all African Americans, convicts or not, were subject to curfews set by their local governments. Even their day-to-day movements were heavily dictated by the state. Black farm workers were required to carry passes from their employers, and meetings blacks took part in were overseen by local officials. This even applied to worship services. In addition, if a black person wanted to live in town, they had to have a white sponsor. Any African Americans who skirted the Black Codes would be subject to fines and labor. In short, in all areas of life, blacks lived as second class citizens. They were emancipated on paper but certainly not in real life. 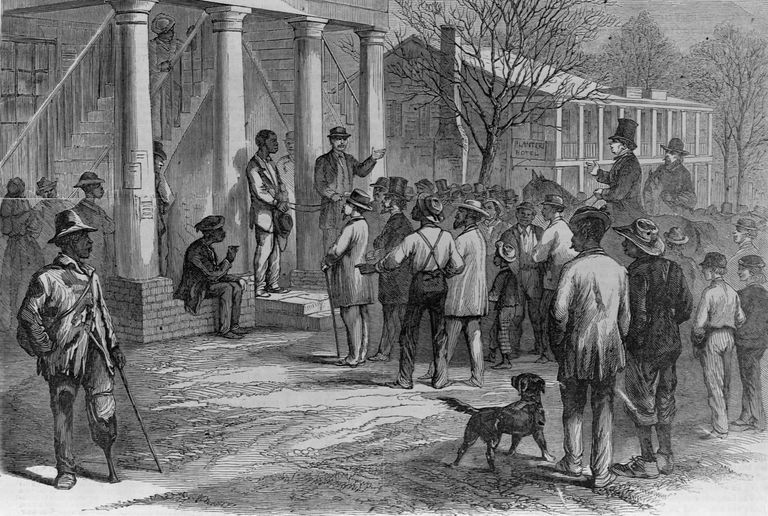 A civil rights bill passed by Congress in 1866 sought to give African Americans more rights. The bill, for example, permitted them to own or rent property, but it stopped short of giving blacks the right to vote. It did, however, allow them to make contracts and bring their cases before courts. It also enabled federal officials to sue those who violated the civil rights of African Americans. But blacks never reaped the benefits of the bill because President Andrew Johnson vetoed it. While the president’s decision dashed the hopes of African Americans, their hopes were renewed when the 14th Amendment was enacted. This legislation gave blacks even more rights than the Civil Rights Act of 1966 did. It declared them and anyone born in the United States to be citizens. Although it did not guarantee blacks the right to vote, it gave them “equal protection of the laws.” The 15th Amendment, passed in 1870, would give blacks suffrage. By the end of the 1860s, many Southern states repealed the Black Codes and shifted their economic focus away from cotton farming and onto manufacturing. They built schools, hospitals, infrastructure and asylums for orphans and the mentally ill. Although the lives of African Americans were no longer dictated by the Black Codes, they lived separately from whites, with fewer resources for their schools and communities. They also faced intimidation by white supremacist groups such as the Ku Klux Klan when they exercised their right to vote. The economic woes blacks faced led to an increasing number of them to be incarcerated. That’s because more penitentiaries in the South were built along with all of the hospitals, roads, and schools. Strapped for cash and unable to get loans from banks, former slaves worked as sharecroppers or tenant farmers. This involved working other people’s farmland in exchange for a small cut of the value of the crops grown. Sharecroppers frequently fell prey to shopkeepers who offered them credit but charged exorbitant interest rates on farm supplies and other goods. Democrats at the time made matters worse by passing laws that allowed merchants to prosecute sharecroppers who couldn’t pay their debts. Angela Davis laments the fact that black leaders of the time, such as Frederick Douglass, did not campaign to end forced labor and debt peonage. Douglass primarily focused his energies on bringing an end to lynching. He also advocated for black suffrage. Davis asserts that he may not have considered forced labor a priority due to the widespread belief that incarcerated blacks must have deserved their punishments. But African Americans complained that they were frequently jailed for offenses for which whites were not. In fact, whites usually eluded prison for all but the most egregious crimes. This resulted in blacks jailed for petty offenses being incarcerated with dangerous white convicts. Black women and children were not spared from prison labor. Children as young as 6 years old were forced to work, and incredibly women in such predicaments were not segregated from male inmates, making them vulnerable to sexual abuse and physical violence at the hands of both convicts and guards. After taking a trip to the South in 1888, Douglass witnessed firsthand the effects of forced labor on the African Americans there. It kept blacks “firmly bound in a strong, remorseless and deadly grasp, a grasp from which only death can free [them],” he noted. But by the time Douglass made this conclusion, peonage and convict leasing had been in effect for more than 20 years in certain places. And in a short stretch of time, the number of black prisoners grew rapidly. From 1874 to 1877, Alabama’s prison population tripled, for example. Ninety percent of new convicts were African American. Crimes formerly considered low-level offenses, such as cattle theft, were reclassified as felonies, ensuring that impoverished blacks found guilty of such crimes would be sentenced to longer prison terms. Today a disproportionate amount of black men are behind bars. In 2016, the Washington Post reported that 7.7 percent of black men between the ages of 25 to 54 are institutionalized compared to 1.6 percent of white men. The newspaper also stated that the prison population has quintupled over the past four decades and that one out of nine black children has a parent in prison. Many ex-convicts can’t vote or get jobs after their release, increasing their chances of recidivism and trapping them in a cycle as relentless as debt peonage. A number of social ills have been blamed for the large numbers of blacks in prison — poverty, single-parent homes and gangs. While these issues may be factors, the Black Codes reveal that since slavery ended those in power have used the criminal justice system as a vehicle to strip African Americans of their liberty. This includes the glaring sentencing disparities between crack and cocaine, a higher police presence in black neighborhoods, and a bail system that requires those arrested to pay for their release from jail or remain incarcerated if they’re unable to. From slavery onward, the criminal justice system has all too often created insurmountable hurdles for African Americans.